In December 1978 Council of Ministers passed a resolution about creation of the Republican Hall of Organ and Chamber Music of Ministry of Culture and remaking the former St. Nicholas Roman Catholic Cathedral room into its concert hall. Placing the concert hall in a room of former church needed execution of big quantity of works that are necessary for its functioning in a new quality. Restoration (the author of a project is O.Grauzhys) and partial reconstruction (the author of a project is I.Tukalevskiy) were carrying out simultaneously. A special attention was given to esthetic decoration and making of comfortable conditions of a hall. Colour stained-glass windows were made in the Baltic States, stylized soft furniture - in Lviv, high-quality parquet - in Kivertsi (Volyn' Region). 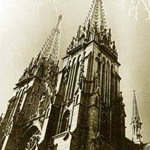 Especially for organ hall, masters of "Rieger-Kloss"Company (Krnov city, Czechoslovakia) constructed a big concert organ. They tried to approximate its look to architecture of a church and that united a unique architecture with a unique instrument.